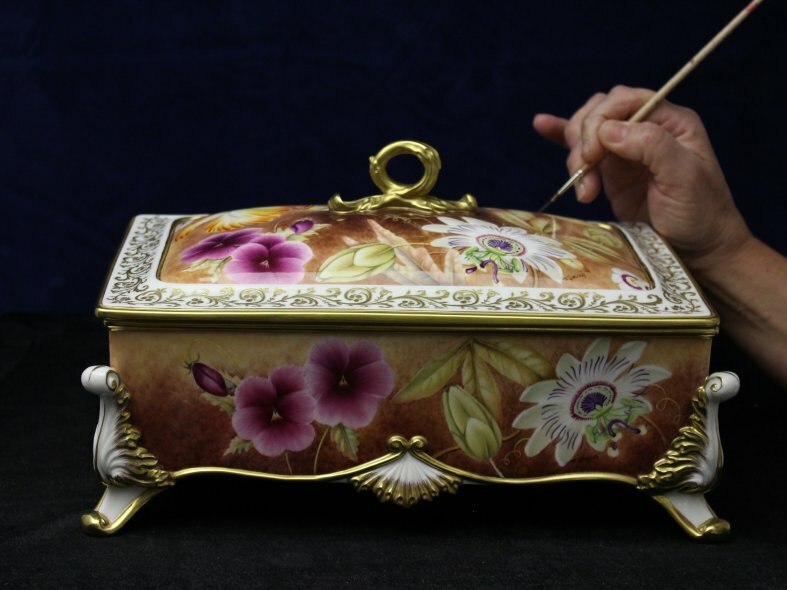 Looking at a pieces as exquisite as Chamberlain & Co's Birlingham Box it can be difficult to conceive how it was made. The shapely silhouette, the perfectly fitted lid, the ornate detailing, even the flawless paintwork are all so impeccably integrated that one might easily imagine that it had just been formed whole. That, however, would be underselling the expertise, dedication and love that go into each and every one of Chamberlain & Co.’s handmade ceramics. Created using a balanced combination of time-honored heritage craft techniques, in depth knowledge of the science of ceramics and the latest technology, the Birlingham Box is part of the splendid new collection from ceramic specialists Chamberlain & Co.
We have decorated the ceramic Birlingham box with three of our most distinctive designs. 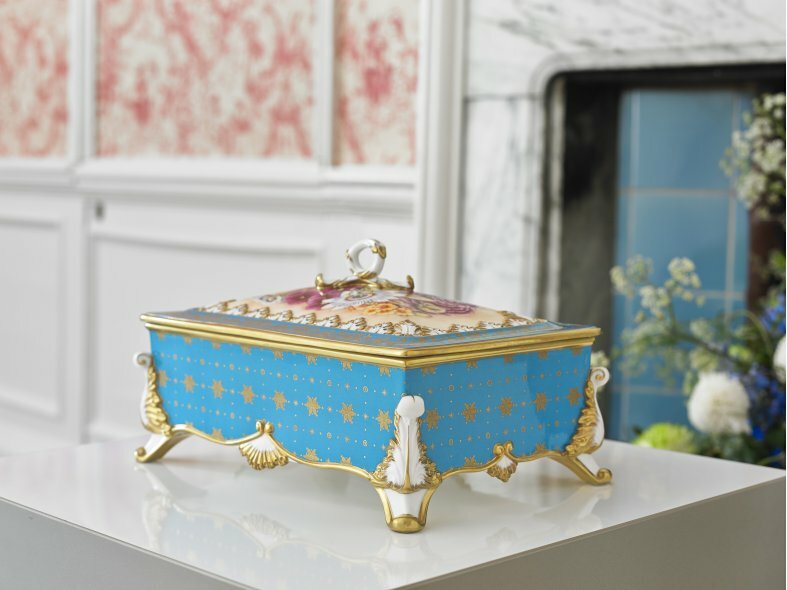 Inspired by the porcelain that graced the court of King George III, the range is ornate, opulent and elegant, combining Regency splendor with the modern aesthetic to create a glorious hybrid of ceramic art. Fit for a king! The glimmering jet black surface is adorned by graceful hummingbirds descending upon tantalising passion flowers so lifelike that one can almost detect the exotic scent. Highlights of 23 Karat gold bring additional lustre to the richly painted surface. This item will transport you back to the days when ornamental homeware was a status symbol, not only a spectacular piece of contemporary art, but also an investment for the future. Exquisite. Timeless. Beautiful. The 3rd design we share, explains how you could commission an entirely new decorative design. In which case we will work closely with you or your interior designers, using our unrivalled knowledge of what can be achieved in fine bone china, to ensure that your vision is realised as perfectly as possible. 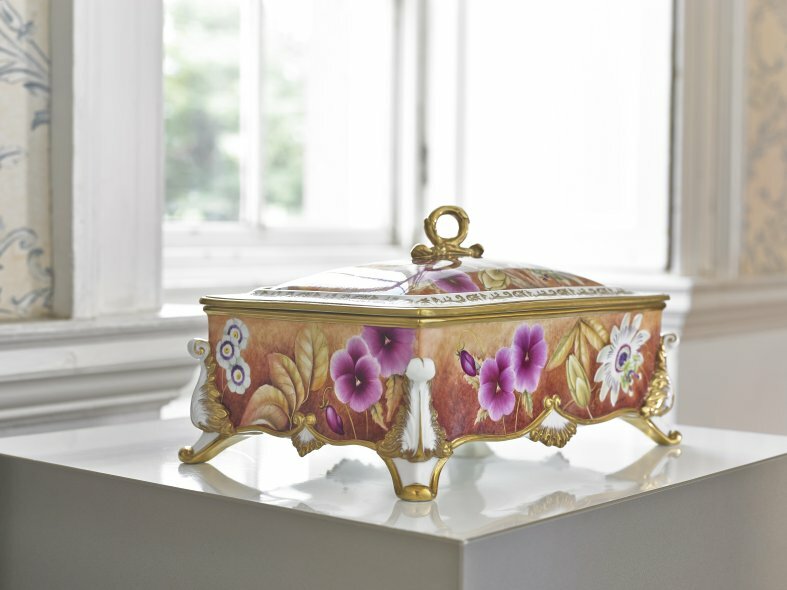 Here we show a rich floral design, entirely hand painted. How better to celebrate your taste and achievements than in a unique and prestigious piece of luxury fine bone china destined to become an heirloom of the future? Each Birlingham Box is fashioned from eight separate pieces of clay and supported by numerous others throughout the shaping and firing processes, more than 50 man hours go into ensuring that every Birlingham Box is as perfect as it is beautiful. The finished profile may look effortlessly graceful, but it takes consummate skill to prevent the clay from following its innate tendencies and "bellying" out; clay yearns to be rounded rather than flat. This shape cleverly defies nature. It's not surprising then, that so few ceramic boxes are available in such prodigious dimensions. 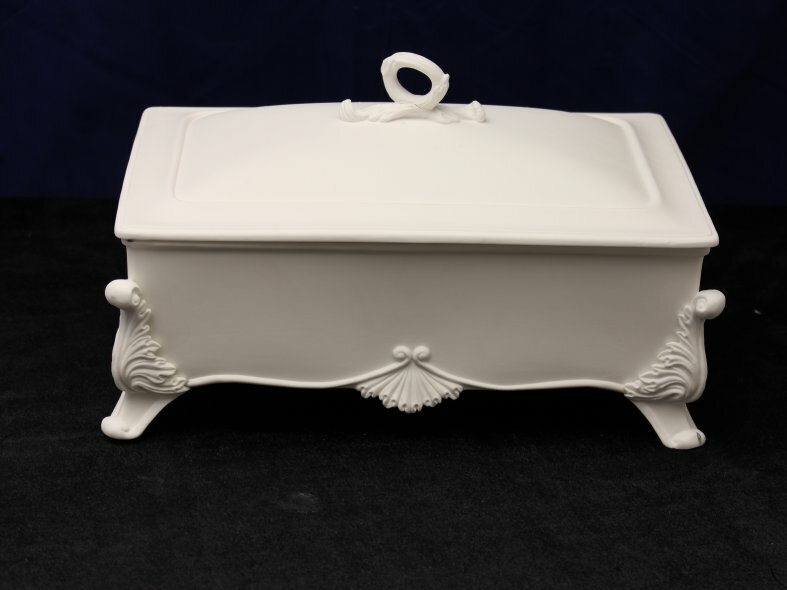 The Birlingham Box measures approximately 34cm x 23cm x 20cm - probably the largest ornamental cast ceramic box in made in the UK. Perfection is a demanding taskmaster. It's true that grace and charm ooze from every Chamberlain & Co. Birlingham Box, but effortless? It takes a vast amount of expertise to make it look that way.